Every year, we all get to celebrate ourselves getting another year older. For many of us adults, it gets a little less fun as every year goes by, but it’s still a favorite celebration for kids. Birthdays are definitely days that should be spent doing something fun with friends and family, but as parents, it can seem pretty daunting to host all of your child’s friends while keeping them happy, fed, safe, and entertained. Here are a few key things to keep in mind when planning your kid’s birthday party so hopefully you’ll stay sane, and maybe have a little fun yourself, too! Select dates and times very carefully. Keep in mind that many young children thrive on certain schedules, and throwing that too out of wack can not only wreak havoc on your party but on you as well. Saturdays and Sundays tend to be the most popular days to throw birthday parties, and for good reason. These days tend to be more open than any of the weekdays, including Friday. Consider throwing a mid-afternoon party around 2 or 3 p.m. as to avoid typical naptimes (nobody likes a room full of cranky kiddos) and to help work around other parents’ schedules. Picking the optimal time might seem like a small detail, but it can save you and other parents a lot of headaches once the party comes. Keep it simple. Make the food as easy as possible. Think finger foods, snacks, bottled water, cupcakes, etc. Whatever you decide, make sure it’s something widely enjoyed by the kids and doesn’t require a ton of effort on your part. Create a theme, but don’t go overboard. Will your activities be fun enough to keep the kids’ attention for the duration of the party? Think ahead, but don’t overthink it. Choose an activity…or two…or three. Kids have a lot of energy, and if you don’t have enough to keep their minds busy, it can backfire really quick for you. If they don’t have something fun to focus on, they’ll end up making big messes in your house or sitting around being bored. You don’t want kids to get too crazy, but you also don’t want them complaining there’s nothing to do. Find a place that does the work for you. Luckily there are many places that would love to host your kid’s birthday party in Reno that have plenty of activities, snacks, and more. In fact, Need 2 Speed is one of those places! We offer some awesome packages that will make your kid’s birthday party the best one yet. Get the kids on the track for a fun race to the finish, or have them break up into teams to take on the mini-golf course. All of the party can be hosted in one of our private party rooms, and we can even provide tasty food and beverages. Trust us, it’ll save you a headache when the load is taken off your shoulders. Whatever you choose, make sure you don’t stress too hard about it. 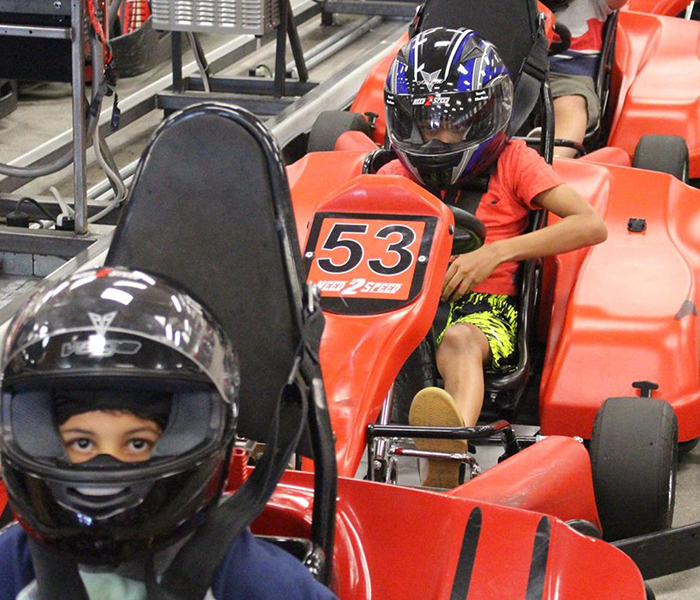 Like we mentioned, our kid’s birthday party packages are created to not only make it easier for the parents to plan, but to also give the kiddos the experience of their lives. We’re pretty sure your child’s party will be the talk of the school next week. Let’s get in touch today to get your party started!